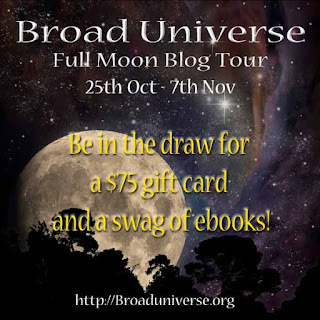 Welcome to the Broad Universe Full Moon Blog Tour! Moonrise. Can you see the light spilling up over the edge of the world, arming the night with possibilities? Oh, I can. I love the moon. I love the moon so much that it seems I can never have just one in my worlds. I adore the imagery you get from moonlight: the still, ethereal quality to the landscape that comes when the moon rises and the shadows yield, reluctantly, to the ghostlight of an orb that can only half command their obedience. The world is different at night; those who conjure moonlight onto the page are already armed with magic. Evion hovered tantalizingly just short of a large cloud, drowning the stars in light. Claira had seen what she needed to see, garnering a few ideas for tomorrow night. Come on, come on, she wished the moon. This sand is cold. Evion disappeared behind the cloud. She waited a moment to let her eyes adjust to the dimmer light, eyeing a faint glow overhead that marked Clarus lurking below the eastern cliff. 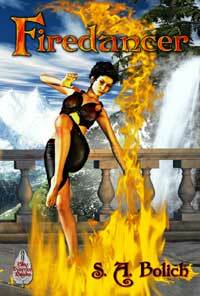 Carefully she worked her hands underneath her body to lift herself off the sand, and froze when a footstep scuffled not two meters away. She fought wild laughter as the man relieved himself against a rock. Just like a cur, marking his territory. She burrowed deeper into the shadows, her face against the red sand to hide the white shine of it. The guard adjusted his clothing and began to stroll up and down in front of the defile, careless of the movement while Evion still hid behind its cloud. She swore under her breath, aware of bright Clarus sliding inexorably up over the cliff top. And with two or more moons in the sky, are they really your friend? Alarion glanced toward the Well of Winds but saw nothing, heard nothing but the frenetic howl of the winds. Kevan’s gaudily red-dappled App stallion clattered down the path behind him, picking its way over the rocks. Double shadows slid and leaped at every movement, a wickedly confusing dance that set the horses snorting. Hera still stood far over the northern peaks, sliding leisurely on its eccentric path across the sky. The mountains gleamed pale under Clarus, brushed with a dim red taint from the lesser moon, all jagged edges like bloody knives. Alarion jerked his gaze away, shivering, sick, his hand a cramped knot of pain. The trail dropped through a confusing tangle of forested ravines. Dust puffed in silvery clouds when the horses plunged onto the traders’ hard-packed road winding toward the river an hour’s ride away. Sera pawed impatiently when Alarion reined her in to let the others catch up. With Habb and Kevan’s App crowding her tail, he glanced down at the rutted road, weighing the odds of breaking a horse’s leg against civil war. He brushed a heel against Sera’s side. She drove in powerful haunches, running hard in the third stride. Kevan’s stallion pounded behind; Habb floated effortlessly beside Sera, the knotted fly-whisks on his bridle streaming in the wind. Alarion let the mare pick her own way among the double shadows, running as if she rode her name. Soon the Street of Temples would be in an uproar, and Bren Shea awakening to a grim gift on his doorstep. Hera was just rising over the long sweep of plain, a red and baleful eye like Death spying on them. Think of being stalked by that moon and its bloody light! Putting multiple moons into the sky is a fun and sometimes frustrating exercise if you care at all about scientific accuracy, which I do. I learned long ago how to tell the phase of our own single moon at a glance, but envisioning the paths of multiple moons traveling at different speeds, in slightly different orbits, makes my head hurt. My eternal gratitude goes to the gurus at space.com for stuff like this. 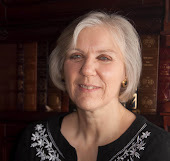 And I am so, em, obsessive in my research that I use this site to make sure I have the correct moon phase for any given actual day that I use in my historical fiction. Will most readers know or care? Probably not. But I do. I'm not the type of writer who enjoys being beaten about the head and shoulders by irate history lovers who would object strenuously to my making the moon at Gettysburg a ghostly quarter peering down at the battlefield when it was really full and set at sunrise or shortly thereafter each day of the battle. I think authenticity counts even in fantasy! I am as inclined as the next writer to have my characters tryst romantically in the moonlight, to capture that rippling light onto water in the wake of moving ships, to paint the landscape in glorious silver light. But I also like to use the moon(s) to full advantage in my worldbuilding, and so you are likely always to find more than one in my skies, contributing to the hero's problems and solutions, each in their own eccentric way. 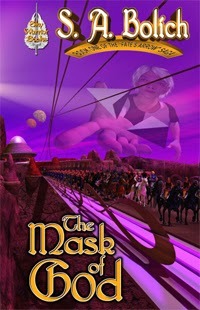 The examples above are all from my Fate's Arrow series, which begins with The Mask of God, and is available everywhere. The third book, The Heart of God, will be available November 1. Get a sneak peek at chapter one here! If you really like moons, check out the full blog tour! Below is a word from our sponsors, and a chance to enter for great prizes, including copies of my own Firedancer, Book 1 of The Masters of the Elements, and The Mask of God, Book 1 of Fate's Arrow.